- the unbaked sculpey is much brighter in color than the baked result, bear that in mind. 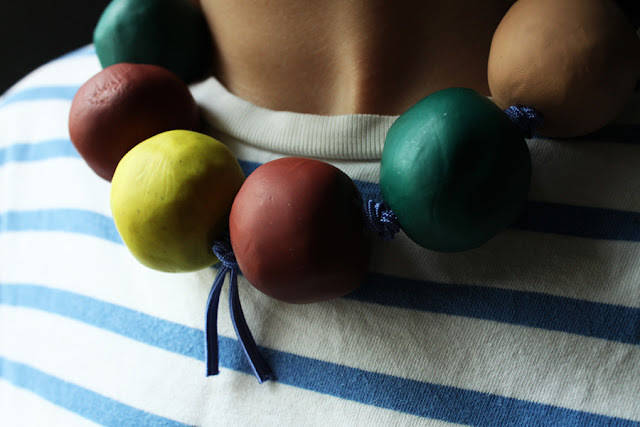 - sculpey is easy to mold, and i loved creating these hand-formed beads, fingerprints and all. 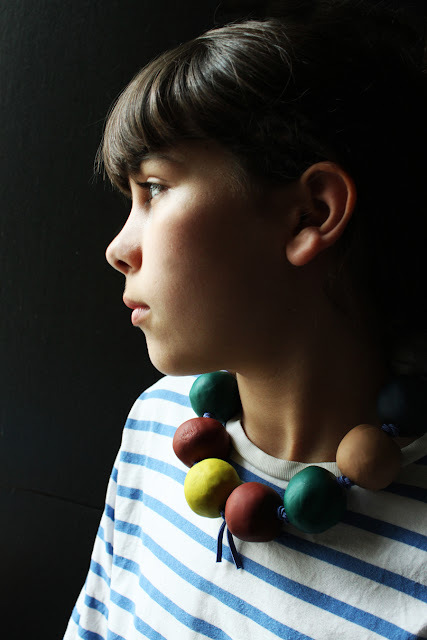 - i used a wooden skewer to create the holes in the beads, easy! - as it states on the package, you have to be really precise about the baking temperature and time. apparently my oven does not distribute heat evenly, so i ended up with a few burnt beads. - contrary to online tips, these burnt bits cannot be sanded off easily - i will save these for another project that requires paint. - the smell of burnt sculpey is not great. finally, i used a colored elastic band in a fun blue color, as i did not want to wear raw jute rope on my bare neck. what do you think?